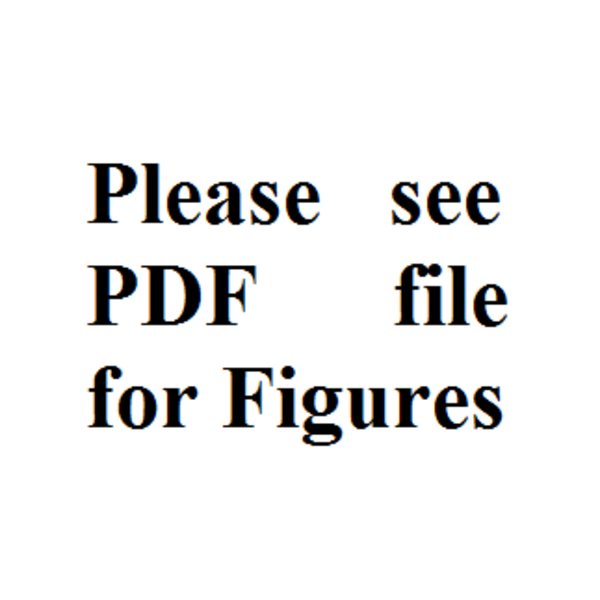 To Cite: Xu H, Gong X, Zhang H H, Zhang Q, Zhao D, et al. Targeting Human Telomerase Reverse Transcriptase by a Simple siRNA Expression Cassette in HepG2 Cells, Hepat Mon. 2015 ; 15(3):e24343. doi: 10.5812/hepatmon.24343. Background: Human telomerase reverse transcriptase (hTERT) has become an ideal target for development of anticancer therapy. Small interfering RNAs (siRNAs) are very powerful reagents for gene silencing and show promise for cancer gene therapy. However, only a small number of siRNAs have been demonstrated to be effective. For gene therapy targeting hTERT, it is essential to develop a robust system to fully explore the power of siRNAs. Objectives: We explored a siRNA expression cassette (SEC) to screen highly effective RNAi-targeted sequences for gene therapy of hepatocellular carcinoma (HCC). Materials and Methods: An SEC was developed by flanking H1 and U6 promoters in opposite directions at the siRNA-encoding sequence. Eight SECs specific to hTERT were designed by overlap extension polymerase chain reaction (PCR) and transfected into HepG2 cells with calcium phosphate. The telomerase activity was determined by telomeric repeat amplification protocol (TRAP) silver staining and TRAP real-time PCR analysis. The mRNA and protein expression levels of hTERT were determined by reverse transcription (RT)-PCR and western blot, respectively. Cell viability was determined by the 3-(4, 5-dimethylthiazol-2-yl)-2, 5-diphenyltetrazolium bromide (MTT) assay and cell apoptosis was measured by the annexin-V/propidium iodide (PI) assay coupled with flow cytometry. Results: Eight hTERT-specific SECs (SEC-1-8) were successfully constructed. In comparison to that of the negative control SEC, the hTERT-specific SECs, especially, SEC-4, SEC-5, SEC-7 and SEC-8 significantly reduced the activity of hTERT in HepG2 cells at 48 hours after transfection. Moreover, the mRNA and protein expression levels of hTERT as well as the cell viability were significantly reduced by SECs. Knockdown of hTERT by SECs in HepG2 cells led to cell apoptosis. Conclusions: Our developed simple SEC was a powerful strategy for screening highly effective RNAi-targeted sequences and showed promise for gene therapy of HCC. Human telomerase reverse transcriptase (hTERT) is the rate-limiting enzyme for the maintenance of telomeres of chromosomes. The activity of hTERT is repressed in normal somatic tissues, but becomes reactivated in 85-90% of human malignancies, including hepatocellular carcinoma (HCC) (1). It is widely accepted that deregulation of hTERT plays key roles during multistep processes of tumorigenesis and anticancer drug resistance. Accordingly, hTERT has become an important target for development of anticancer therapies, with numerous agents in both preclinical and clinical trials. Currently, there are a number of compounds that target hTERT, including papaverine (2), β-carboline alkaloid harmine (3), crocin (4) and the dominant-negative mutant of hTERT (DN-hTERT) (5). RNA interference (RNAi) with small interfering RNA (siRNA) has been proven a powerful tool for gene knockdown through directed post-transcriptional gene silencing. Imani Fooladi et al. found potential use of siRNA for prophylaxis and treatment of Pseudomonas aeruginosa-induced hematogenous pulmonary infection in human (6). At present, siRNA is achieved by either chemical synthesis or siRNA-expressing vectors (7). However, chemically synthesized siRNA is expensive, thus preventing its large-scale application in preclinical and clinical trials; while vector-delivered siRNA is tedious for screening highly effective RNAi-targeted sequences and has long-term safety risks for clinical applications. To overcome limitations of the cost of chemically synthesized siRNA and time-consuming synthesis of vector-delivered siRNA, the concept of siRNA expression cassettes (SECs) has been explored. SECs are siRNA expression templates obtained by polymerase chain reaction (PCR) and can be delivered into cells directly without cloning into expression vectors. SECs were first constructed by Castanotto et al. through four rounds of nested PCR (8). Similarly, Gou et al. used a two-step PCR procedure to generate a chimeric DNA template containing U6 promoter and a short hairpin DNA (9). However, the disadvantage of a short hairpin RNA (shRNA) expression cassette is that two complimentary long oligoribonucleotides, which include sense, loop and antisense sequences, have to be chemically synthesized. Chemical synthesis of these long oligoribonucleotides is very expensive and error-prone. Tran et al. co-expressed the sense and antisense RNAs using dual U6 promoters (10); nevertheless, application of the same U6 promoters might lead to unwanted homologous recombination, hence limiting its efficiency. Here, we reported the construction of SECs that contain two distinct DNA polymerase III promoters, human H1 and U6 promoters, to drive the expression of the sense and antisense strands of the siRNA, respectively. Our results demonstrated that these SECs specific to hTERT efficiently inhibited both the mRNA and protein expression of hTERT in HepG2 cells. Moreover, they reduced the cell viability and induced cell apoptosis. The plasmids pSUPER retro Neo + GFP with the H1 promoter and pRNAT-U6.1/Neo with the U6 promoter were from The Cancer Institute of Central South University (Changsha, China). The overlap extension PCR was designed to produce an SEC from the above two plasmids (Figure 1). These PCRs needed four primers. Two universal U6 forward and H1 forward primers were used in all PCR amplifications. 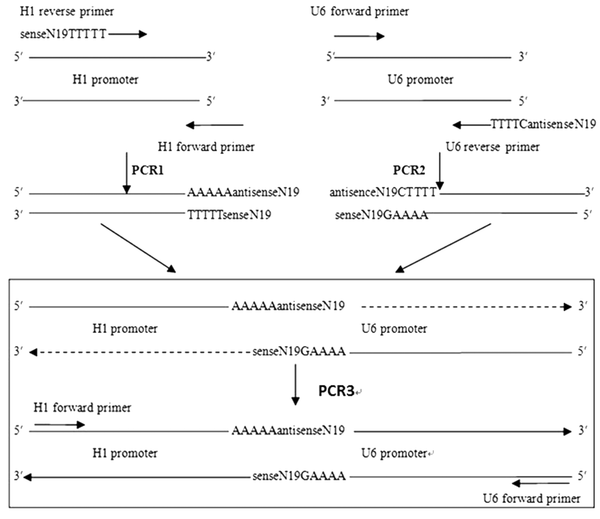 The other two specific primers (U6 reverse primers and H1 reverse primers) were designed to contain the following sequences; a 19-nt siRNA targeting sequence, termination signal sequences of the other promoter and a promoter-specific sequence, which could anneal to the end of the template plasmid during PCR amplification. The last five nucleotides of each promoter were substituted by “-CTTTT-” and “-TTTTT-”, which served as the termination signals for the H1 and U6 promoters, respectively. The specific 19-nt siRNA targeting sequence was designed from the hTERT mRNA (NM-198253) by the BLOCK-iT™ RNAi Designer. The specific targeting site and its corresponding primer sequences are listed in Table 1.
a The TTTTT and CTTTT flanking the underlined sequences served as the U6 promoter and H1 promoter termination signals, respectively. PCR 1 and PCR 2 were performed with Taq Master Mix (OMEGA, USA) under the following conditions; 3 minutes at 94°C, 30 seconds at 95°C, 30 seconds at 55°C and 1 minute at 72°C for 32 cycles followed by incubation at 72°C for 5 minutes. PCR 3 was performed with ExTaq DNA polymerase (TaKaRa, Japan) under the following conditions; 3 minutes at 94°C, 30 seconds at 95°C, 30 seconds at 50°C and 1 minutes at 72°C for five cycles (without ExTaq DNA polymerase) followed by 30 seconds at 95°C, 30 seconds at 66°C and 1 minutes at 72°C for 28 cycles and incubation at 72°C for 5 minutes (with ExTaq DNA polymerase). The PCR products were purified with a PCR purification kit (Thermo, USA) and confirmed by sequencing (Shaenggong, China). HepG2 cells were cultured in Dulbecco’s modified Eagle medium (Hyclone, USA) supplemented with 10% fetal bovine serum at 37°C in a CO2 incubator. The cells were transfected with SECs using calcium phosphate reagents (11). Each experiment was repeated three times. TRAP is a standard method for detection of telomerase activity. Unlike western blotting, which detects the relative protein expression levels, TRAP directly detects the activity of proteins. At 48 hours after transfection, telomerase activity was determined by TRAP with two primers (TS, 5’-AAT CCG TCG AGC AGA GTT-3’ and ACX, 5’-GCGCGG[CTTACC]3CTAACC-3’) (12). The cycling program was 25°C for 30 minutes, 94°C for 3 minutes (without Taq DNA polymerase and ACX) followed by 95°C for 30 seconds, 55°C for 30 seconds and 72°C for 1 minute (33 cycles, with Taq DNA polymerase and ACX). PCR products were analyzed by polyacrylamide gel electrophoresis (PAGE) with silver staining. The PAGE gel was grayscale scanned by Quantity One software (Bio-Rad, USA) on each lane. SYBR Green (Thermo, USA) was used for absolute quantification of telomerase activity with two primers (TS, 5’-AAT CCG TCG AGC AGA GTT-3’ and ACX, 5’-GCGCGG[CTTACC]3CTAACC-3’). The standard TSR8 (5’-AATCCGTCGAGCAGAGTTAG[GGTTAG]7-3’) (13) was diluted to eight different concentrations (amol/µL): 5, 1, 0.2, 0.04, 0.008, 0.0016, 0.00032 and 0.000064. Real-time PCR was performed under the following conditions; 30 minutes at 25°C, 10 minutes at 95°C, 15 seconds at 95°C and 30 seconds at 60°C for 40 cycles. TRIzol reagent (Thermo, USA) was used for total RNA extraction. An RT-PCR kit (Thermo, USA) was used for the RT reaction. Quantitative analysis was performed using β-actin as an internal reference. The primers for hTERT were as follows; forward, 5’-AAGTTCCTGCACTGGCTGATG-3’; reverse, 5’-GCTTTGCAACTTGCTCCAGAC-3’. For β-actin: forward, 5’-TGACGTGGACATCCGCAAAG-3’; reverse, 5’-CTGGAAGGTGGACAGCGAGG-3’. The cycling program was 95°C for 2 minutes, 95°C for 20 seconds, 62°C for 20 seconds and 72°C for 20 seconds (40 cycles). The relative level of RNA was computed using the 2-ΔΔCt analysis method. Total proteins from cells were extracted on ice with cell lysis buffer (Cell Signaling Biotechnology, USA). Equal amounts of proteins (20 µg) were separated by 8% sodium dodecyl sulfate (SDS)-PAGE and transferred onto polyvinylidene difluoride (PVDF) membranes (Millipore, USA). The membranes were blocked with 5% fat-free milk in phosphate-buffered saline (PBS) at room temperature for one hour and probed with primary antibodies (hTERT, 1:1000, Abcam; β-actin, 1:2000, Proteintech Group, USA) overnight at 4°C. Then, the membrane was incubated with horseradish peroxidase-conjugated secondary antibody (Abcam) at room temperature for 45 minutes. Reactive bands were detected using enhanced chemiluminescence reagents (Amersham Pharmacia Biotech, USA). After transfection, cells were cultured in 96-well plates for 1-5 days. The cell viability was analyzed by the MTT assay. At the indicated time points, 20 μL of MTT solution (5 mg/mL) was added to each well and incubated at 37°C for four hours. Then, the medium was replaced with 200 µL of dimethyl sulfoxide. The absorbance of each well was measured in an enzyme immunoassay analyzer at 490 nm. At 48 hours after transfection, cells were collected and subjected to annexin V/PI double staining according to the manufacturer’s instructions (Keygen Biotech, China). The samples were then analyzed using a FACS scanner (Becton Dickinson) and the FlowJo software (Tree Star, Ashland, OR, USA). All data were expressed as means ± standard deviation and statistical analysis was performed using analysis of variance. All P values were based on two-sided hypothesis testing and P < 0.05 was considered statistically significant. The SECs for each of the targeting sites were successfully established as confirmed by PCR analysis (Figure 2). The single H1 and U6 promoters were 245 bp and 366 bp, respectively. The SECs were 592 bp confirmed by DNA sequencing. a, DNA Marker I Ladder; b-f, the single H1 promoter by PCR 1 (245 bp); g-k, the single U6 promoter by PCR 2 (366 bp); l-p, the SECs by PCR 3 (592 bp). Eight SECs specific to the target sites 1778-1796, 1800-1818, 1943-1961, 2650-2668, 2760-2778, 3009-3027, 3878-3896 and 3964-3982 of hTERT were designated as SEC-1, SEC-2, SEC-3, SEC-4, SEC-5, SEC-6, SEC-7 and SEC-8, respectively (Figure 3A). These hTERT-specific SECs were produced by the above two convergent Pol III promoters PCR and transfected into HepG2 cells. Forty-eight hours after transfection, telomerase activity was determined by TRAP silver staining analysis. Compared with that of mock and negative SEC, all eight target site-specific SECs significantly decreased the telomerase activity to different degrees (Figure 3B). RNAi inhibition rates were 55.00 ± 1.23%, 42.38 ± 5.07%, 47.60 ± 2.36%, 78.50 ± 2.48%, 70.95 ± 4.18%, 60.35 ± 1.67%, 81.80 ± 5.82% and 79.51 ± 5.73%, respectively, all of which were significantly different from the negative control group (3.56 ± 0.70%) (P < 0.05) (Figure 3C). SEC-4, SEC-5, SEC-7 and SEC-8 demonstrated the strongest inhibitory effects on telomerase activity (Figure 3C). These results showed that our constructed hTERT-specific SECs efficiently decreased the telomerase activity in HepG2 cells. A) Target sites specific to hTERT B) HepG2 cells were transfected with the indicated SECs. Forty-eight hours later, the telomerase activity was determined by TRAP silver staining analysis. C) Inhibition rate of RNAi, Inhibition rate of RNAi (%) = the relative telomerase activity of the negative control group-the relative telomerase activity of the experimental group; relative telomerase activity = (scanning gray value of the experimental group/scanning gray value of the negative control group) × 100%. 1-8: SEC-1-8; M, pBR322 DNA/Mspl Marker. Mock, calcium phosphate reagent only; NC, negative control SEC; B, Blank control. To further validate our observation that hTERT-specific SECs downregulated the telomerase activity in HepG2 cells, we applied TRAP by real-time PCR to accurately determine the telomerase activity following SEC transfection. In TRAP real-time PCR analysis, telomerase RNA components as templates by themselves were reversely transcribed into the telomerase extension products, which were further determined by real-time PCR. Thus, this method directly detected the activity of proteins. After 48 hours of transfection of SEC-2, SEC-4, SEC-7 and SEC-8, the telomerase activity in HepG2 cells was substantially decreased. The amounts of telomerase extension products (copies) after SEC-2, SEC-4, SEC-7 and SEC-8 transfection were 11.69 ± 1.16, 3.70 ± 0.29, 2.17 ± 0.17 and 1.730 ± 0.11, respectively, which were significantly different from the negative control group (40.94 ± 2.37) (P < 0.05) (Figure 4). HepG2 cells were transfected with the indicated SECs. 48 hours later, the telomerase activity was determined by TRAP real-time PCR analysis. Mock, calcium phosphate reagent only; NC, negative control; 1-4, SEC-2, SEC-4, SEC-7, and SEC-8, respectively. To check whether the observed decrease of telomerase activity following SEC transfection resulted from siRNA-mediated downregulation of hTERT mRNA and protein expression, we conducted RT-PCR and western blot analyses. Both the mRNA and protein expression levels of hTERT in HepG2 cells were significantly decreased 48 hours after transfection with SEC-1, SEC-3 or SEC-4. The relative expression levels of hTERT mRNA were 0.68 ± 0.03, 0.69 ± 0.04 and 0.54 ± 0.07 by SEC-1, SEC-3 and SEC-4, respectively, which were significantly less than by the negative control SEC (1.10 ± 0.11) (P < 0.05) (Figure 5). HepG2 cells were transfected with negative control, SEC-1, SEC-3 and SEC-4. 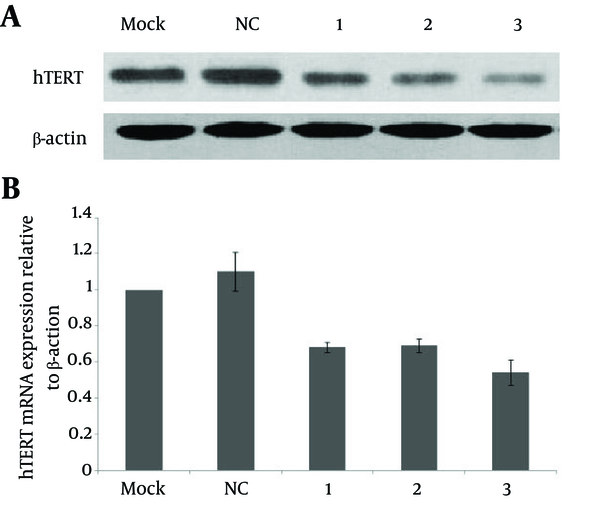 A) The protein expression of hTERT was determined by western blot 48 hours later, using β-actin as the loading control B) The relative mRNA levels of hTERT were determined by real-time PCR, with β-actin as the internal control. Mock, calcium phosphate reagent only; NC, negative control; 1-3, SEC-1, SEC-3 and SEC-4, respectively. To assess the effect of SECs on cell proliferation, we treated HepG2 cells with SEC-4 and SEC-7 and examined cell proliferation by the MTT assay. 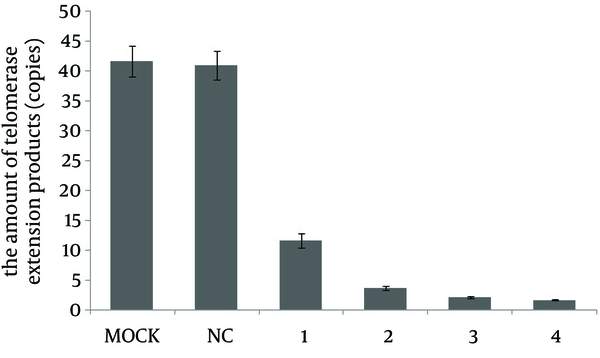 As shown in Figure 6, from the third day, the proliferation rates in the SEC-4 and SEC-7 groups were significantly lower than the control group (P < 0.05). 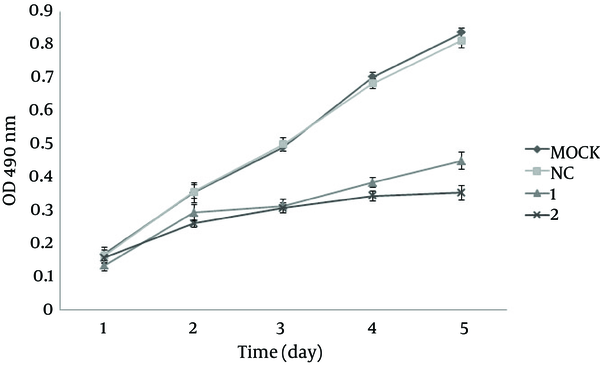 HepG2 cells were transfected with the indicated SECs or controls for 1-5 days. Cell viability was determined by the MTT assay. Mock, calcium phosphate reagent only; NC, negative control; 1, SEC-4; 2, SEC-7. To further investigate the effect of SECs on cell apoptosis, we then applied annexin V/PI double staining of HepG2 cells after treatment with SECs. Annexin V vs. PI plots from the gated cells showed the populations corresponding to viable (Annexin V-/PI-), necrotic (Annexin V-/PI+), early (Annexin V+/PI-) and late (Annexin V+/PI+) apoptotic cells (Figure 7A). The apoptosis rates (early apoptosis and late apoptosis) in the SEC-4 and SEC-7 groups were 68.19 ± 2.42% and 73.73 ± 1.34%, respectively, which were significantly higher than that in the negative control group (5.50 ± 0.20%) (P < 0.05) (Figure 7B). HepG2 cells were transfected with the indicated SECs or controls for 48 hours. Cell apoptosis was assessed by annexin V/PI staining coupled with flow cytometry. A) Representative histograms. 1, calcium phosphate reagent only; 2, negative control; 1, SEC-4; 2, SEC-7. B) Quantification of A. Mock, calcium phosphate reagent only; NC, negative control; 1, SEC-4; 2, SEC-7. In this study, we developed a novel SEC containing human H1 and U6 DNA polymerase III promoters to drive the expression of the sense and antisense strands of a siRNA, respectively. Our results demonstrated that this type of SEC specific to hTERT efficiently inhibited both the mRNA and protein levels of hTERT in HepG2 cells. Moreover, SECs targeting hTERT inhibited cell proliferation and induced apoptosis of HepG2 cells. Our study suggested that SECs are a powerful strategy for screening highly effective RNAi-targeted sequences and showed promise for gene therapy of HCC. El-Saeed et al. found that detection of hTERT-mRNA was superior to α-fetoprotein in the diagnosis of chronic liver disease and could be used as a marker for early diagnosis of HCC (14). Moreover, regarding the critical roles of hTERT in tumorigenesis and anticancer drug resistance as well as powerful gene knockdown through directed post-transcriptional gene silencing, targeting hTERT by RNAi has become a promising novel strategy for the development of anticancer treatments. Zhang et al. transfected chemically synthesized siRNA directly into SiHa cells, but the efficacy of RNAi targeting hTERT was limited (15). To achieve stable and long-term RNAi, Cheng et al. (16) and Fang et al. (17) improved the RNAi efficiency using a plasmid or adenoviral vector, but construction of plasmid was tedious and exogenous viral DNA of the adenoviral vector has long-term safety risks for clinical applications. Therefore, it is essential to develop a fully robust system to optimize the efficacy of designed siRNAs. We developed a novel and simple strategy to produce siRNA by SECs with two opposing polymerase III promoters. Once transfected into cells, gene-specific sequences could be transcribed by H1/U6 promoters to generate RNA duplexes, which would silence the corresponding gene expression. It has been reported that two different convergent promoters could increase the transcription efficiency (10); thus, we accordingly selected two different RNA Pol III promoters. Although construction of dual promoter vectors for RNAi has been reported (18, 19), our method of producing SECs was affordable and simple. Moreover, compared with the LineSilence™ RNAi Kit (Allele, USA), our design is more cost-effective. In our system, the two forward primers are identical for all PCRs and only the two reverse primers containing the targeting sequence need to be synthesized. Therefore, it is time-saving to screen the effective RNAi sites and safe for long-term clinical applications. To validate our strategy, we constructed eight SECs specific to hTERT and determined their efficiency in HepG2 cells. Compared with mock and negative SECs, all eight target site-specific SECs significantly decreased the telomerase activity to different degree. Moreover to avoid a “single cell type phenomenon”, we transfected SEC-4 and SEC-7 targeting hTERT in Bel-7404 and HeLa cells. In Bel-7404 cells, the RNAi inhibition rates of SEC-4 and SEC-7 were 67.49 ± 2.06% and 77.95 ± 1.99%, respectively, which were significantly higher than that of the negative control (5.03 ± 0.22%). Similarly, the RNAi inhibition rates of SEC-4 (72.98 ± 2.97%) and SEC-7 (82.90 ± 3.15%) in HeLa cells were significantly different from that of the negative control (3.95 ± 0.33%). However, the results demonstrated that the inhibition rate of RNAi ranged from 42% to 81%, indicating that not all target sites were very effective. For the sites inside the open reading frame, SEC-4 and SEC-5 showed the highest efficiency. It is possible that the two target sites fell on hTERT V867M and R901W variants, which have been demonstrated to be associated with telomere shortening (20, 21). For the 3’-UTR sites, SEC-7 and SEC-8 showed the highest efficiency, indicating that 3’-UTR plays an important role in RNAi through not only miRNA, but also siRNA. In summary, we successfully constructed hTERT-specific SECs by overlap extension PCR and demonstrated that hTERT-specific SECs significantly inhibited telomerase activity in HepG2 cells. Our strategy of producing SECs would provide a novel and promising method to screen effective RNAi-targeted sequences and would accelerate development of nonviral cancer gene therapies. Authors’ Contributions: Jian Xiong Peng developed the original idea and the protocol, supervised the whole study. Hui Xu abstracted and analyzed data, wrote the manuscript and revised the manuscript for important intellectual content. Xia Gong and Hui Hui Zhang contributed to the development of the protocol and prepared the manuscript. Qin Zhang and Dandan Zhao provided administrative, technical and material support. Funding/Support: This work was supported by a grant from the National Natural Science Foundation of China (98SSY1003).